October 9, 2011 (La Mesa) – La Mesa resident Susan Brinchman, director and founder of the Center for Electrosmog Prevention, has announced that she will join the Occupy San Diego effort downtown with rallies to draw attention to health issues involving smart meters. While SDG&E and other utilities contend the devices are safe, Brinchman contends she has suffered health problems since installation of a smart meter at her home and has been leading efforts to require that utilities give consumers a choice to opt out of smart meter installations. 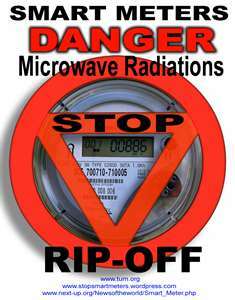 She has compiled links to various studies suggesting potential health risks linked to radiation from smart meters and other devices. Amy O'Hair http://mail.electrosmogprevention.org/edgedesk/cgi-bin/compose.exe?id=01... of www.stopsmartmeters.org.